UNITED NATIONS, May 31 -- With international justice being called for in Kampala and about Gaza, Inner City Press on Memorial Day asked Sudan's Ambassador to the UN which junior US diplomat attended the inauguration of Omar al Bashir, indicted by the International Criminal Court for Darfur, and what it meant. 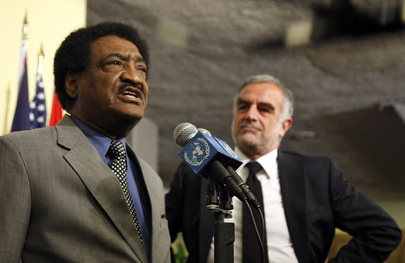 "I am not that interested in that," Sudan's Permanent Representative said. "The Sudanese people celebrated, not waiting on any outsiders to come and give us legitimacy." Video here, from Minute 2:02. Off camera, he has bragged to the Press that "China sent a high level delegation... a minister." The attendance by the U.S., however, has given rise to sharp critiques of the Obama administration and its envoy to Sudan, Scott Gration. The US Permanent Representative to the UN Susan Rice was not present for Monday's emergency Security Council meeting about the assault on the flotilla to Gaza, and so could not be asked. Last week, she walked away from the stakeout microphone as Inner City Press asked if the US would be represented at any level at Bashir's inauguration. During hours of milling around outside the Council about Turkey's draft Presidential Statement about the flotilla, Sudan's Ambassador tried to turn the focus repeated to the ICC. Israel, he said, is "writing the Kampala communique." Inner City Press pointed out that Israel is not a state party to the ICC. Nor is the U.S., despite sending a representative to the Kampala conference on the crime of aggression. The question of the day outside and inside the Council was who would investigate the assault on the flotilla -- Israel itself, or the UN? Some began talking of a "Goldstone Two." 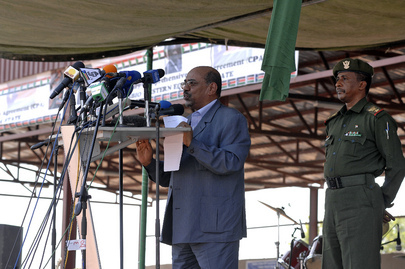 Sudan's Ambassador, responding to Inner City Press, brought it full circle. The UN's Ban Ki-moon, he said, should condemn the flotilla attack and should provide an update on earlier investigations, in the destruction of UNRWA premises and schools. 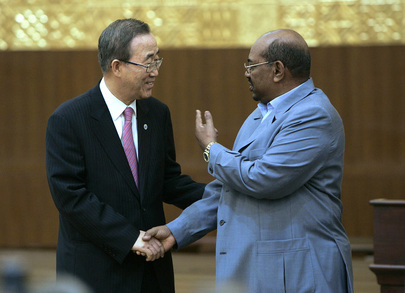 Mr. Ban, of course, sent his two top Sudan envoys to Bashir's inauguration. So we'll see. UNITED NATIONS, May 25 -- With two senior UN officials set to attend the inauguration of indicted war criminal Omar al Bashir on May 27, the UN's approach to international criminal justice is being called into question. Yet without irony on May 25 the UN's top lawyer Patricia O'Brien told a largely empty conference room of delegates they should fund the UN-assisted Extraordinary Chambers in the Courts of Cambodia because "we cannot contemplate the possibility of the trails faltering for want of financial support, that would strike a blow not only to the ECCC , but also to international criminal justice more broadly." Having Haile Menkerios, recently named by Secretary General Ban Ki-moon, attend a ceremony celebrating Omar al Bashir, changed by the International Criminal Court with crimes against humanity and war crimes, strikes a blow to international criminal justice. Inner City Press: ... particularly for Mr. Menkerios, who is solely a UN not AU employee, was this, did the Office of Legal Affairs, who essentially sort of authorized what seems to many to be a change of policy, even going back as far as, I mean, to have UN officials engage with an indicted, someone indicted for crimes of war is something new. And who signed off on that? Spokesperson Nesirky: It’s just not true that it’s new. It’s just not true. The point is that both these gentlemen, Mr. Gambari and Mr. Menkerios, are appointed by the Secretary-General under a Security Council mandate to carry out a job in Sudan — in the case of Mr. Gambari jointly under the African Union, as you pointed out. Their job is to interact with the Sudanese Government. That’s their job, to ensure that the missions, the important missions, the large missions trying to do the work that you mentioned in the previous question; they interact. That’s obvious. Nesirky: And as the Secretary-General said yesterday, this is no more, no less than their participation in an event that carries political significance as well as being a ceremony. It has political significance, but crucially, they have a mandate to be there and to interact with the Sudanese authorities. Inner City Press: [inaudible] keep contact at the high level such as the Secretary-General, I would assume Mr. Menkerios to a minimum necessary to carry out the operational functions, because, I mean, Human Rights Watch has said this is legitimizing, or really, minim… making a mockery of the fact that if somebody is indicted for war crimes and yet can meet openly and be celebrated by UN officials. Is that, what’s the Secretary-General’s response to that? Spokesperson: Well, first of all, Human Rights Watch are entitled to their view, and they do extraordinary work. The second thing is they have a job to do, large missions to run. They need to be able to interact with the Sudanese authorities and they have a mandate to do so. Nesirky then refused Inner City Press' follow up question, turning to another reporter, who asked about... Bashir. The questions will not go away. Footnote: Also on May 25, Inner City Press asked staff of the US Mission to the UN if anyone would attend Bashir's inauguration for the US. When US Permanent Representative to the UN Susan Rice appeared at the Security Council stakeout position, Inner City Press waited while she made statements about North Korea and Iran, when asked loudly, On Sudan, will anyone from the US attend Bashir's inauguration? Video here, from Minute 6:32. Ambassador Rice walked away, and the question has yet to be answered. Watch this site. UNITED NATIONS, May 21 -- When indicted war criminal Omar al-Bashir holds an inauguration on May 27 for having won the recent fraud and violence plagued election, two senior UN official will be in attendance: Haile Menkerios and Ibrahim Gambari, Inner City Press was told on Friday. Inner City Press: who from the UN system if anyone will be attending the inauguration of Omer Al-Bashir on 27 May? There has been a call by some human rights groups that various world leaders should not attend. Who is attending for the UN? Mr. Menkerios? Do you know? Spokesperson Martin Nesirky: I’ll find out who has the invitation card. Question: [So the UN is going to] go, I mean, there is no question? Spokesperson Nesirky: That’s not what I said. I said I’ll find out where the invitation card, who received the invitation card. Those cards usually have an RSVP on them, and we can let you know how, whether there has been an RSVP. On May 21 Nesirky's deputy Marie Okabe responded that both Menkerios and Gambari will attend, calling them "the senior UN officials on the ground... in contact with the host government regularly to ensure that their missions are able to function effectively." Video here, from Minute 5:16. While the International Criminal Court makes UN interaction with Bashir controversial, this phrasing about contact necessary to run the UN missions is rationale for contacts. But how is attending the inauguration necessary? Inner City Press: The Minister of Communications of the South Sudanese Government, Paul Mayom, has criticised UN Radio Miraya for putting on rebel General [George] Athor and he said not only that he was wrong, he said I can stop it. He closed down the radio station for undermining stability in South Sudan. What does the UN think of his statement? Spokesperson Nesirky: Well, we’re aware of the statements, and I know that my colleagues there on the ground have indeed been speaking to the Ministry concerned. It was the Regional Coordinator for Southern Sudan from UNMIS who had a meeting with the Minister of Information, and I am informed that they discussed, in a constructive manner, matters of mutual interest. And the Minister of Information expressed concerns about Radio Miraya and its coverage. And I am advised that these concerns are being addressed by the radio station. The point about this radio station is that it is committed to promoting the Comprehensive Peace Agreement and the culture of peace in Sudan with objectivity and professionalism. Inner City Press: When you say it’s addressed, does the UN agree that it should not put on rebel, you know, renegade Generals like Mr. Athor, or are they going to continue to…? Spokesperson Nesirky: What I said is that it’s being addressed. Inner City Press: Oh, okay. Spokesperson: Not that it has been addressed. Apologies if I misspoke. I thought I said these concerns are being addressed by the radio station. Spokesperson: Well, this is a UN-sponsored radio station, not a UN radio station, as I understand it. But the point is that the coverage of the elections just as one example — but an important example — was marked by neutrality and professionalism, and as I have mentioned just now, a commitment to the spirit of the Comprehensive Peace Agreement. While Ms. Okabe did not provide any further information on this on May 21, at the previous evening's reception for Cameroon's 50th anniversary of independence, Sudan's Permanent Representative to the UN told Inner City Press that the UN should put this anti-South Sudan government on the air. And so the government of Omar al-Bashir, usually critical of the United Nations and of freedom of the press, is ironically supporting UN-affiliated Radio Mireya in its dispute with Southern Sudan for putting renegade general Athor on the air. And the UN's two most senior officials in Sudan will attend an indicted war criminal's inauguration. And so it goes.